Welcome one and all to another Retro Review special edition of Longbox Junk, where I put aside my usual dollar box fare to take a closer look at comics I own that might be considered a bit more "Collectible" or "Valuable". This time out, we head back to 1977 and check out a bit of an odd bird in Marvel's Bronze Age stable of characters. . .or perhaps I should say an odd Lizard? 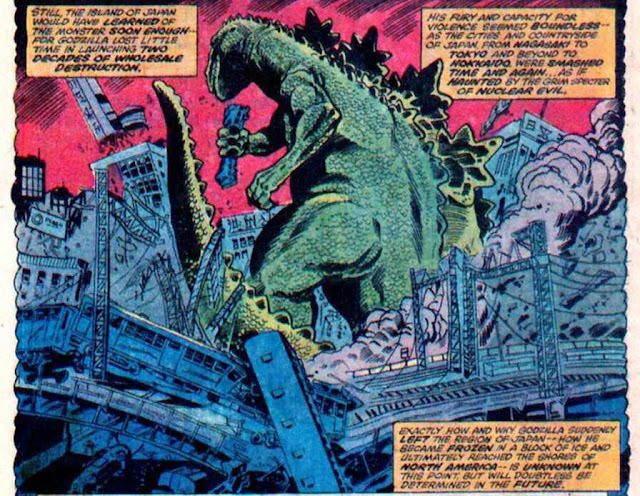 It's that gigantic city-stompin' metaphor for the danger of nuclear weapons in all his green glory. . .GODZILLA! The mid-to-late 1970's was a period of great expansion and creativity for Marvel Comics. In addition to their growing stable of superhero titles, Marvel was bringing in a lot of licensed properties from toys and movies in an attempt to expand their "universe" into other areas and genres. . .comics based on The Micronauts, ROM: Space Knight, Shogun Warriors, Logan's Run, Planet of The Apes, 2001: A Space Odyssey, Battlestar Galactica, and the Big Daddy of the 70's. . .Star Wars! And then there was Godzilla. 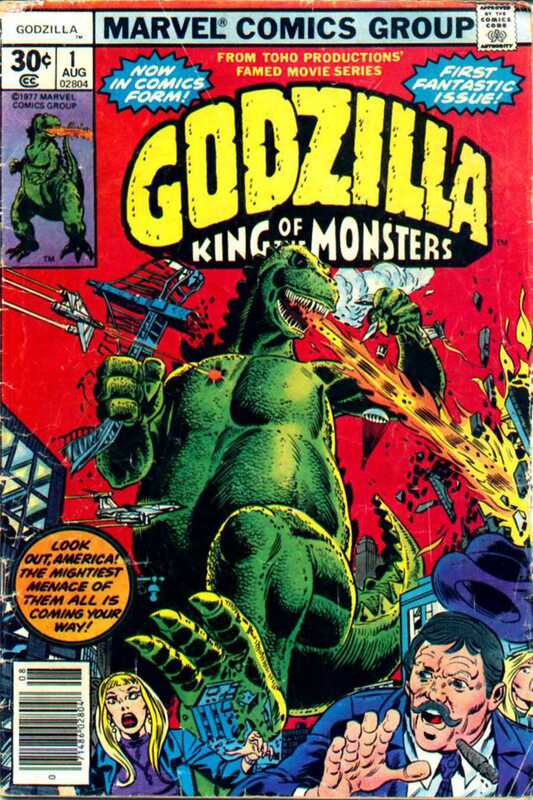 Godzilla was a bit of an unusual licensed property in that Marvel tied him firmly into their established shared universe from the very first issue. Other licensed property comics crossed over into the Marvel Universe from time to time, but generally remained in their own lane and doing their own thing. I basically bought this comic (like many of the other older comics in my collection) for the cover, to use as part of my rotating collection of comic art on the wall of my office at work. 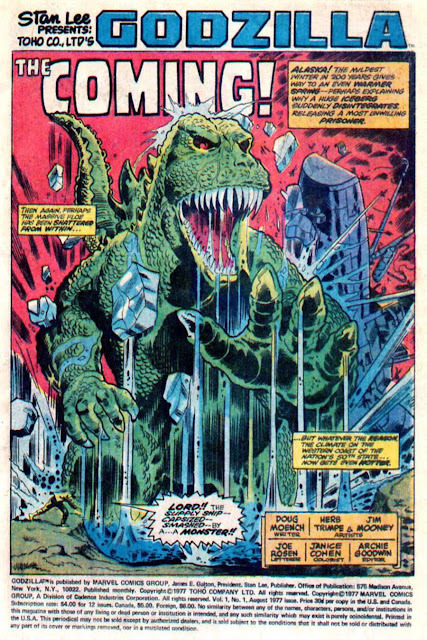 Except for a quick flip through and confirming that yes, Godzilla is wrecking stuff, I've never read this comic. . .until now. So I bought Godzilla for the cover. . .let's start with the cover. It's GLORIOUS! The bright, primary colors of the sky, title, and Godzilla are about as close to perfect coloring as a cover can get. The red sky is an especially inspired choice. It makes everything pop against it nicely. . .especially the yellow title. The perspective of looking up at the hulking monster from the viewpoint of the terrified citizens fleeing the destruction gives the cover a great sense of scale and movement. If I have one complaint about this awesome cover, it's that the guy with the hat and mustache in the right corner looks kind of goofy. Other than that, this cover is a winner in almost every way! We immediately get slammed in the face with an awesome splash page of Godzilla smashing his way free from an iceberg off the coast of Alaska that he's presumably been trapped inside of for a while. He destroys a ship and proceeds inland to start doin' what Godzilla does by smashing a lighthouse. It doesn't take Godzilla long to get a few more miles down the road, where he proceeds to attack a station on the Alaska pipeline. . .showing his monstrous dislike for America's greedy thirst for oil by ripping out a section of the pipeline and using it as a weapon on the terrified workers. Luckily for them, S.H.I.E.L.D. has received distress calls from the destroyed ship and lighthouse and a helicarrier commanded by Dum-Dum Dugan is on its way to the scene, with a jet piloted by Nick "If you had MY job, your teeth would always be clenched too" Fury himself following behind carrying some passengers with government clearance who claim to have some information on the situation. Dugan sends out a battalion of troops on armed flying platforms, but Godzilla swats them like flies, so Dugan jumps into the cockpit himself and joins a squad of fighter jets on the attack. Unfortunately, they're no match for Godzilla either and Dugan finds himself parachuting to safety and realizing that this might be more of a fight than he thought it would be. The story pauses for breath for a moment and we get a short page and a half recap of the origin of Godzilla, slightly modified from the movie version: Godzilla is an ancient creature awakened by underwater nuclear tests instead of a creature created by those tests. The result is the same, though. . .a gigantic creature that wreaks occasional destruction on Japan for about 20 years before mysteriously disappearing. . .until now! After the brief interlude for Godzilla's origin story, we cut back to the battle at hand, where Dugan has choppers airlift down a giant laser cannon from the S.H.I.E.L.D. helicarrier. As they get it set up, we return for a moment to the jet piloted by Nick Fury and learn that the important passengers he's transporting are Yuriko Takiguchi. . .the lone survivor of Godzilla's initial attack during the nuclear tests that woke the beast and a man who has dedicated his life to studying the creature. Along with Dr. Takiguchi are his assistant, Tamara Hashioka and his grandson, Robert Takiguchi. It's not really explained WHY Dr. Takiguchi has decided to bring a 10 year old kid along to try and stop the destructive rampage of (in his own words) ". . .the most dangerous and unpredictable being alive." It would SEEM that one would want to keep your young grandson pretty far away from something like that. . .BUT I DIGRESS! Back with Dum-Dum Dugan and the S.H.I.E.L.D. forces on the ground, the laser cannon is finally ready and Dugan gives Godzilla a direct shot to the head with "the fire of nine thousand amplified and combined laser beams", which SOUNDS pretty awesome, but it barely makes Godzilla flinch. Worse, Godzilla decides that if it's gonna be like THAT, he can do it like THAT too, and breaks out the nuclear fire breath on the laser cannon, easily destroying it before turning the rest of the buildings, the forest, and pretty much everything within the surrounding valley into a flaming inferno for good measure. As Godzilla smugly strides off down the valley looking for more stuff to destroy, Dugan realizes that he's not only been beaten, but beaten so badly that he doesn't even have a ride home. Fortunately for him, Nick Fury arrives with his passengers to pick him up and we learn that Dr. Takiguchi has plans for some sort of secret weapon to use against Godzilla. Dugan and Fury are skeptical, after seeing the way the creature just handed S.H.I.E.L.D. 's best a pretty harsh beatdown. The issue ends with Godzilla stomping his way into the distance with a "Next: Seattle under siege!" to let us know that Godzilla isn't anywhere near finished destroying just yet. All right, let's break it on down. . . It's a pretty simple story, and does well as an introduction. Godzilla is awakened once again, this time in North America. He goes on a rampage (as Godzilla does) and S.H.I.E.L.D. responds. Godzilla beats S.H.I.E.L.D. 's best and continues his rampage toward a major American city. There's a Japanese specialist who claims to have a secret weapon. 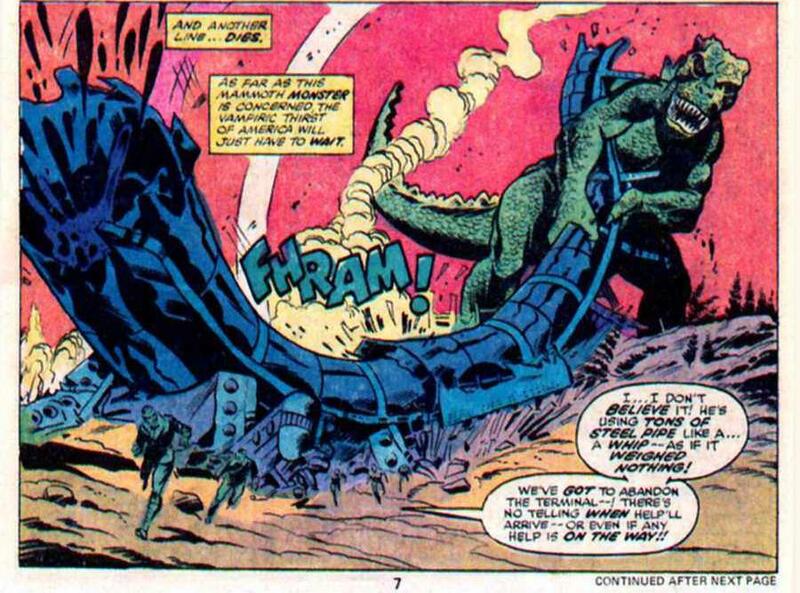 Plus we get a short recap of Godzilla's (slightly modified) origin. It's mostly an extended battle scene, but it's well-written and is a fast, easy read. This first issue firmly sets Godzilla into the established Marvel Universe by bringing S.H.I.E.L.D., Nick Fury, and Dum-Dum Dugan into the picture right off the bat. I have to say that I liked it a lot for what it is. You don't come into something like Godzilla expecting Nobel Prize-winning literature, and with that in mind, I got a little more than I expected. Doug Moench gives his caption boxes just the right amount of Mighty Marvel bombast to carry a story featuring a giant monster battling S.H.I.E.L.D. beyond the objectively ridiculous idea of it all, and really made me wish I had the next issue to read. The art is also a lot better than I expected. A lot of times with tie in or licensed properties the art tends to be weak. . .after all, why put in the effort when something has a built-in audience? Trimpe does a great job on this comic. . .with some pages and panels really standing out, like the opening splash page. . . I also have to give credit to the color artist on Godzilla. A lot of these Bronze Age comics (especially licensed material) are sloppily colored. The coloring is good in this issue, and it makes a big difference. Overall, I have to say that I was pleasantly surprised by Godzilla #1. I bought it for the cover, but discovered some decent writing and art inside for a Bronze Age licensed property about a giant rampaging lizard. It's not the best comic I've ever read, but if you come into ANYTHING having to do with Godzilla expecting great things, you're probably going to be disappointed . .so for what it is, it's really good. It's good enough that if I see more Marvel Godzilla comics lurking in the back issue boxes, I'll probably pick them up. Back to Longbox Junk business as usual as I try to get back on track with the definitive origin of Doctor Doom in Marvel's 6 issue Books of Doom mini. At one point I had amassed 18 issues of Godzilla, grabbed from quarter boxes, so it's not like I put a lot of investment money into it. And then one day I was finished with comic book reading and collecting, and ended up selling them all at a garage sale, unread. I didn't have issue #1 though. Now, years later and back in the hobby, I was able to scoop up issues #4 and 5 for 50 cents each, and I'm glad to have this part of Marvel history in my collection. And especially so #5, as my local comic shop owner has his only published letter included in that issue. Thanks for this retro review and helping me to remember that I still have these two unread issues sitting in my file cabinet of fun! I may need to include one soon in an episode of Cool Comics, because I need to finally read an issue or two for myself! As always, you write the best, most entertaining reviews out there! I agree, neato review on one of the forgotten books. I am happy you did this one, as I have been coming around to picking up more bronze age books as of lately. They have definitely been on my radar, and quite a few on my watch lists now. Spider-man Maximum Carnage Full Set + The Aftermath Issues, Trial By Jury 01-02. The Avengers V1 #234 Marvel 1983 Vf/nm Newsstand - Origin Of Scarlet Witch!